Hello everyone, got a couple of new updates to share (as of 4/8/2019)! 1.) The train room is getting a light upgrade, as its very dark in there and desk lamps are no longer up to the task of providing this light (according to my dad). 2.) The early stages of getting the PLRX powered (a.k.a. planning) has begun but the problem of electrical shorts has yet to be completely solved. 3.) One of the track corners is going to be widened as some of the PLRX's grain hoppers are having issues turning it. Unfortunately, a lack of sufficient space may limit the new width but such needs to be done in order to allow these cars to be operated on this particular track section. Thanks for the update. When can we expect to see some new pics of the train set? @Brandon wrote: Thanks for the update. When can we expect to see some new pics of the train set? The last of the installation work is complete now (4/12/2019), just wanted to share this information. In response to your question brandon, I will do my best to get some pics of the PLRX in its current form on here as soon as I can. I apologize in advance for its unkept appearance but, as I've said before, the construction progress is subject to delays. I also look forward to seeing some pictures. No pics to share today (4/18/2019), but I may have some to share by the end of Easter weekend as my mother is planning to have some of my family and a few of her friends over for a big supper on Saturday (I think). hello all, got another update to share! As of 6:40pm on 4/20/2019, the early stages of a 3rd tunnel have been completed now but its still going to be a while before trains are operating on the setup. I apologize for posting this update so late but troll issues have forced me to postpone this. I now have some pics of the PLRX, which is still under construction at this time (as of 15:20hrs on 4/22/2019. The single-ended staging yard. 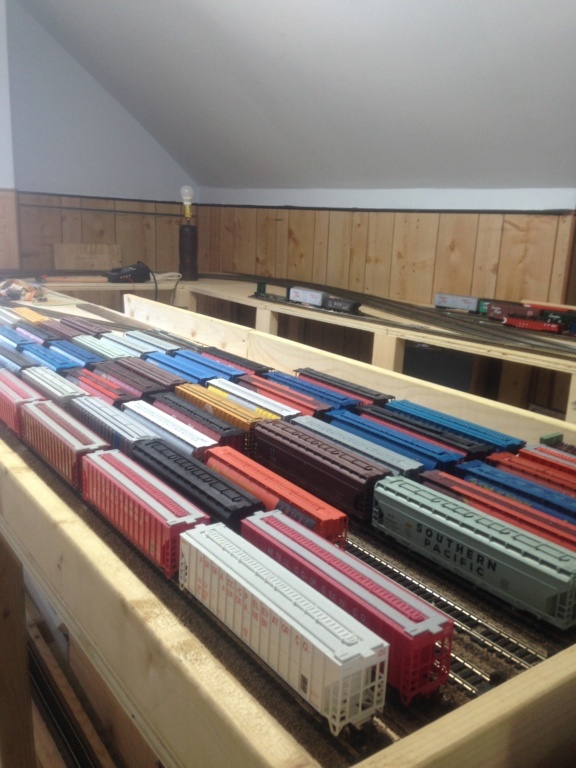 There are 47 grain hoppers in storage here right now and they are a mix of Athearn, Bachmann, MDC/Roundhouse & Walthers products. One can also see a little bit of a small freight unloading & car storage yard across the aisleway. 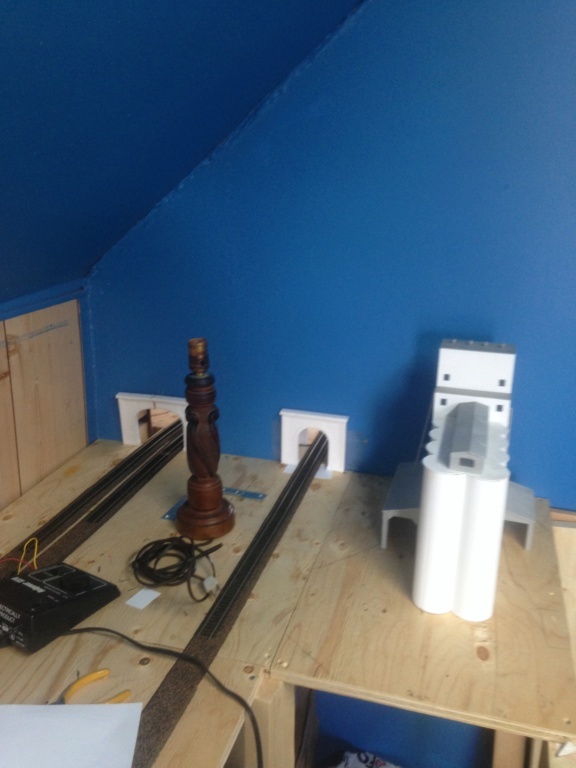 A shot of the double tunnel on the "bedroom" side of the train room. The large white building on the right hand side is a Walthers grain elevator kit. The latest work done (which took place befoe the 2019 Easter weekend). Unfortunately this work was quite hard due to a wall stud. Thanks Aaron, I do what I can to keep u all informed about this matter. Unfortunately work on this project may become stalled due to my father's employment obligations, which is disappointing, but it can't be helped. Hello everyone, got another update to share! 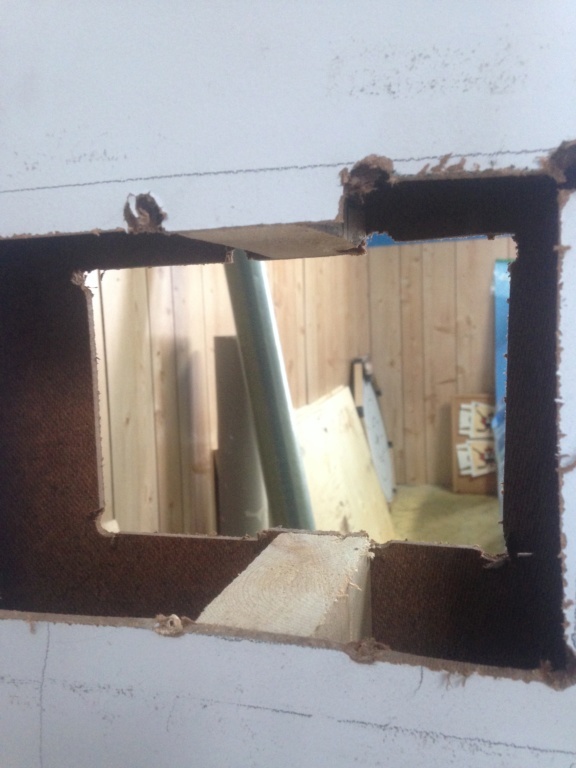 As of 14:00hrs on 4/24/2019, there is a new piece of benchwork in the "Bedroom" section of the train room installed and the open spaces of the new tunnel have been filled in with scrap pieces of wood. A small bit of benchwork is going to be installed in the "Common" section of the train room directly across from where the future mainline/car storage & unloading yard is. According to my dad, there will be a fold down bridge spanning this gap but such is going to be constructed and installed at a later date. Please stay tuned for further updates as the construction progress continues.